C-EB Braves’ boys basketball team holds an 11-3 record and 43.571 seed points entering the last month of the season. Senior Cecelio Montgomery is receiving a lot of attention and credit for his strong presence on the court, but he will tell you that his teammates are just as important in the equation as he is, and credit needs to go to each player for his contribution to the score board and the defense the Braves have developed to hold their top seating in the region. 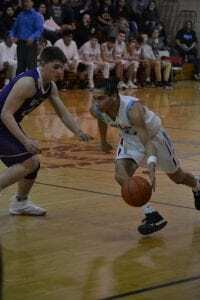 In the games this past week against Standing Rock and Winner, Montgomery scored 27 and 21 points respectively, followed by Senior Naden Saucedo, who scored 14 and 15 points. Spencer Moran, Nevyn Mendoza and Leon Brown Otter consistently get on the board to help with the wins. The Braves defeated Standing Rock 86-64 and Winner 69-55. Their next home game is Feb. 8 against Mobridge-Pollock. On Feb. 12, they play St. Francis and Feb. 16, Pine Ridge also at home.